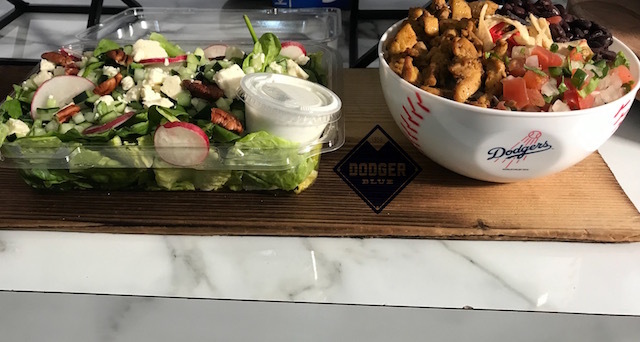 With the Los Angeles Dodgers set to embark on a season that they hope will end with a World Series title, executive chef Ryan Evans and his team have created exciting dining options that will be available at Dodger Stadium throughout the year. In addition to six new offerings, Evans returned “Esquite” and the “Going Yard” sausage, both of which were unveiled for last year’s National League Championship Series. The sausage can be found near sections Field 10, Loge 133 and Reserve 4. The corn will be sold near Field 22 and 23, and Top Deck 6. 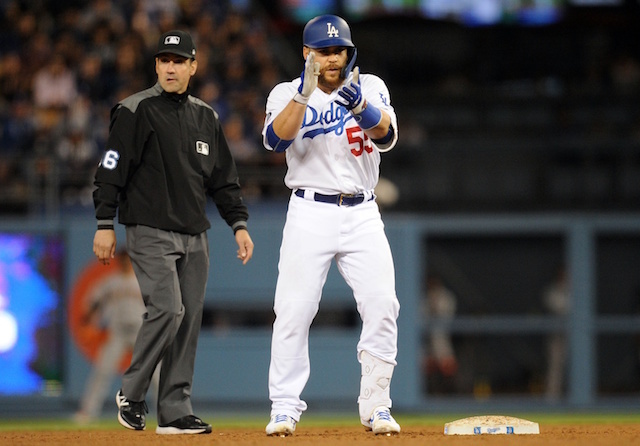 Evans is entering this third year as Dodger Stadium executive chef, and remains committed as ever to innovation. “It’s been a great ride so far,” he said. 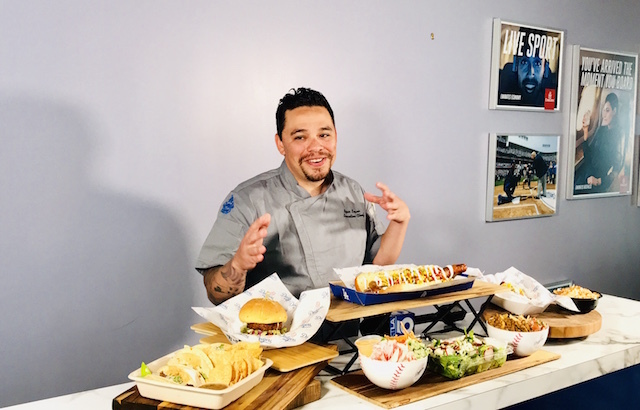 After receiving feedback from fans, Evans is excited to offer a Dodger Stadium menu that will expand on sausages and vegetarian options, and see the return of tacos. He began curating options late last year. “It’s not easy. We start, like, Nov. 1. It’s a long process,” Evans explained. “I would say it takes about two months to develop what you see today. The reason behind that is we want to look at everything. We want to look at what’s around where we want to place things. 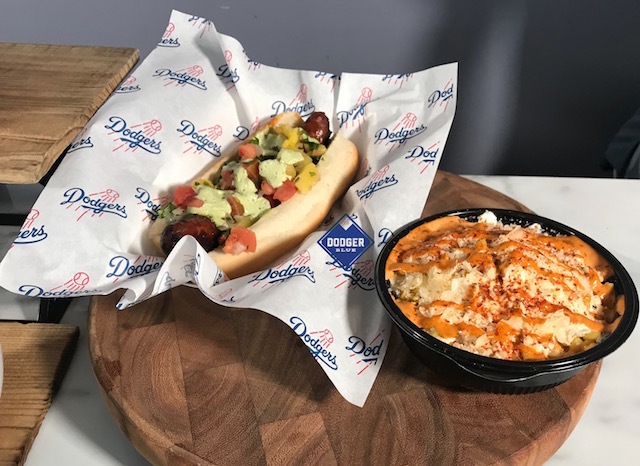 Easily the biggest hit of the food tasting event was the “Dodger Sausage.” Exclusive to Dodger Stadium, Evans worked with Maestro to create an al pastor sausage that is topped with a pineapple salsa and cilantro-lime crema. 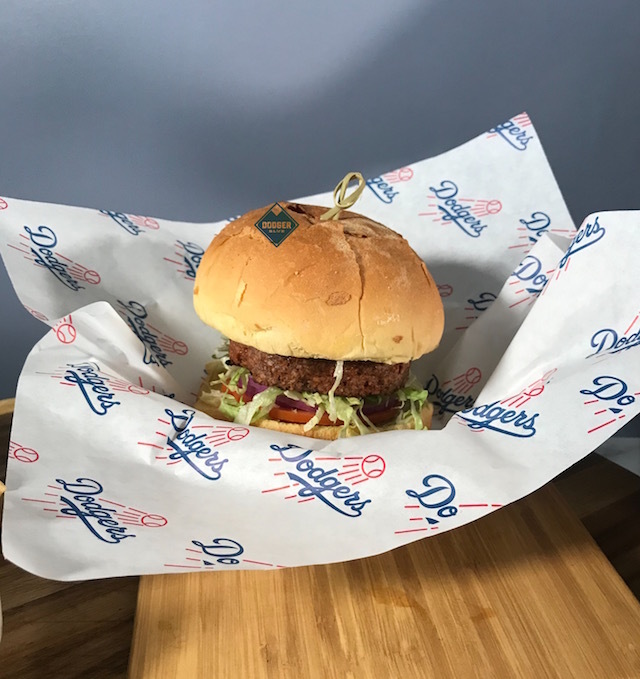 The “Dodger Sausage” will be available at On-Deck locations (Field 10, Loge 133, Reserve 4), which are transitioning to offering an array of sausages this season. An Italian, bratwurst and Beyond Meat bratwurst will be among the items sold. The Beyond Meat will double as a vegetarian option. “It’s a vegan sausage, it’s going to have grilled onions on top of it. That’ll be huge for our fanbase to be able to access that on all levels. It’s replacing our veggie dog throughout the building,” Evans explained. 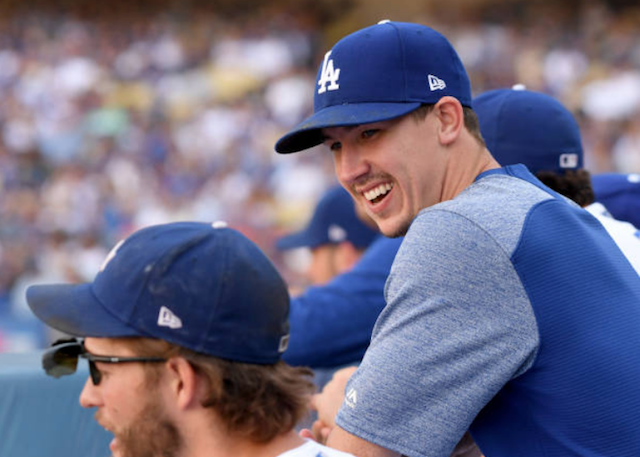 Meanwhile, as part of his quest to fill Dodger Stadium with dining options that represent the City of Los Angeles, Evans was thrilled to announce the return of tacos. “We had it, took it away — shame on us — now it’s back. It’s back better than it was before,” he said. Along with tacos, burritos will also be on the menu at Taqueria stand locations (near Field 10 and Reserve 13). Furthermore, for the first time, chicken will be available outside of being limited to a special offering. 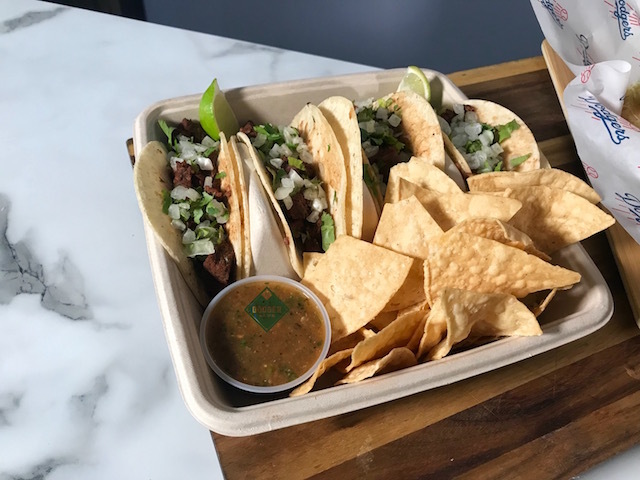 “You can get either four tacos or two tacos. We’re really excited about this,” Evans said. For those seeking a lighter fare, a burrito bowl can be found on the Reserve level. Options include chicken, beef and vegetables. Burrito bowls can be found near Loge 137, and Reserve 23 and 24. Chopped romaine with baby spinach is topped with dried cucumbers, sliced radishes, crumbled feta cheese, pecans or walnuts with a creamy mint dressing. The salad can be found near Field 5, Loge 132 and Reserve 10. A refined “California Roll Bowl” is also coming to Dodger Stadium this season. “You think about a California roll, it’s imitation crab, some mayonnaise dressing, sometimes they have cucumbers or carrots in it. We basically wanted to create that over sushi rice, in bowl form,” Evans said. 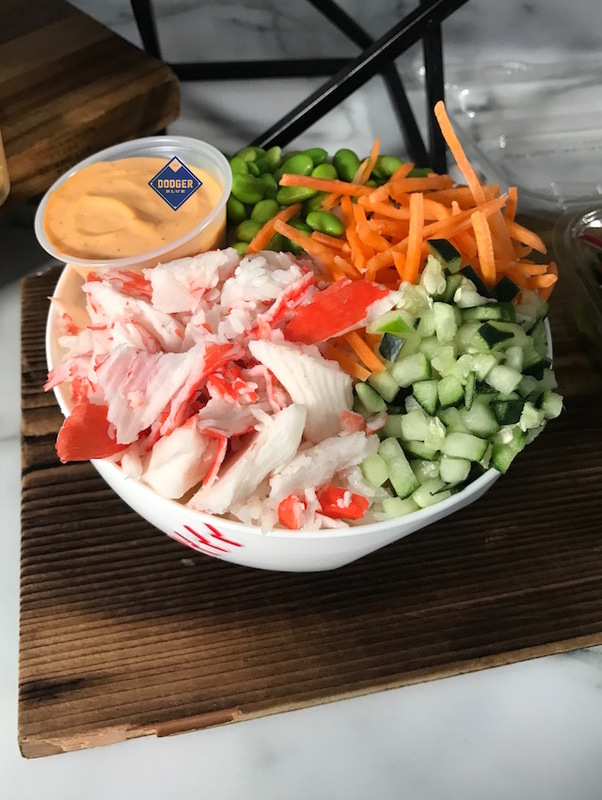 The “California Roll Bowl” will be available on Field level near section 45. Perhaps the most progressive offering is the “Beyond Meat Burger” that can double as a vegan option as well. “We work with Budweiser Anheuser-Busch, we’ve got some great burgers in that stand, but one of the things we felt we were lacking was another vegetarian option,” Evans said. “Last year we did the portobello (mushroom) burger, this year Beyond Meat is blowing up and we’re offering the sausage, let’s do the burger as well. And we wanted to keep it simple. It’s lettuce, tomato, mayonnaise and burger. So that way, if we have some vegan fans that don’t want the mayonnaise, we can build it without the mayonnaise and it’s fully vegan. The “Beyond Meat Burger” will be sold near Field 47 and Reserve 29. Even with the six new food items and specials Evans will roll out for specific series, the Dodger Dog remains a staple. 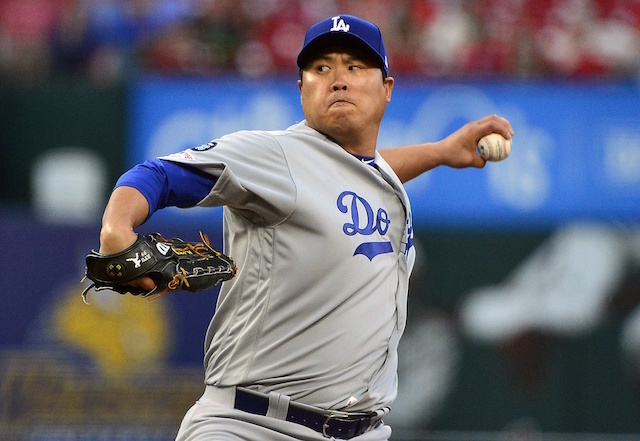 He estimated the team sells 2.5 million Dodger Dogs per season, and that 95 percent of them are grilled.